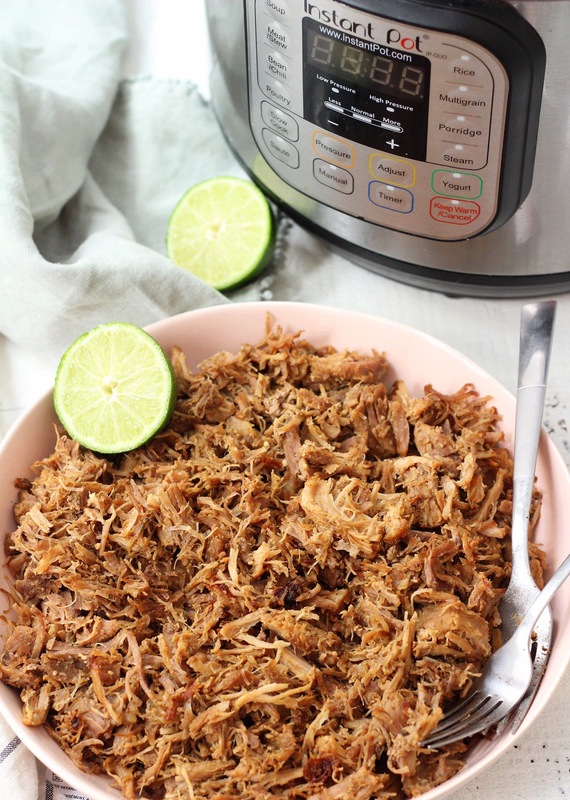 This easy Whole30 and Paleo instant pot carnitas recipe only needs a few simple ingredients and less than an hour to cook perfectly! 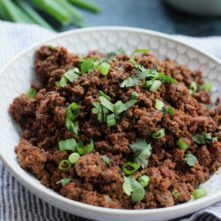 This is a great Whole30 pork recipe for meal prep, or as a family friendly recipe for tacos or burritos without the clean up. 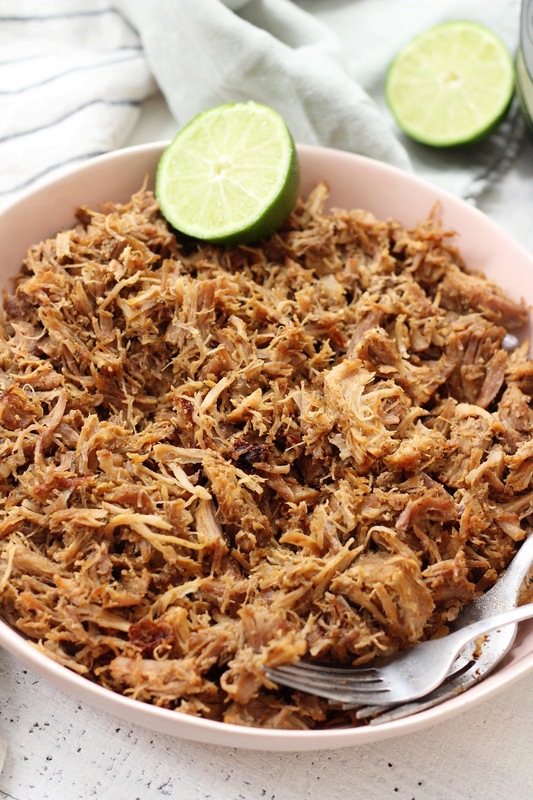 You’ll have plenty of carnitas meat for the week for easy lunches, which is my favorite thing to use it for! I know I’m not alone here, but I just can’t stop using my instant pot. At first I thought I would hate it and never get used to how “complicated” it was. I’m horrible with change, okay?! Soon I found myself loving all of the functions of it more and more and today I don’t think it leaves my counter. 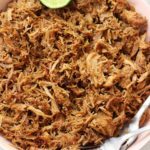 This Paleo instant pot carnitas recipe is the perfect example of why it’s so superior (in my opinion) to other methods of cooking. To both cook the pork, and then crisp up the Whole30 carnitas meat once it’s done cooking, I don’t have to dirty any other pans! Switch the instant pot to sauté mode and you’re good to go. When I’m doing a Whole30, or just eating home most of the time in general, if I can get away with doing as few dishes as possible I’m going to. Some people say you have to put an orange into Paleo instant pot carnitas, however, I disagree. Feel free to do that if you’d like. For me, that makes the meat much too sweet and I’m not into that. I do love juicing half of a small lime into the instant pot before you close’er up though. 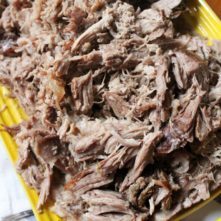 This Whole30 instant pot carnitas recipe makes a lot of meat. So plan to have leftovers, or use it for meal prepping taco bowls. 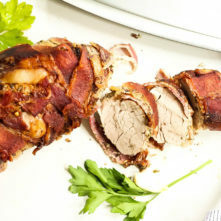 Or, if you’d rather, you can use a smaller pork shoulder, or freeze the leftover meat. You could make this in the slow cooker using the same ingredients, however you’d want to cook for 4-6 hours on low. Then transfer the meat after you’ve shredded it to a large skillet. In the skillet you’ll let the Paleo carnitas meat crisp up over medium-high heat for about 5-8 minutes, stirring or using tongs to move around. 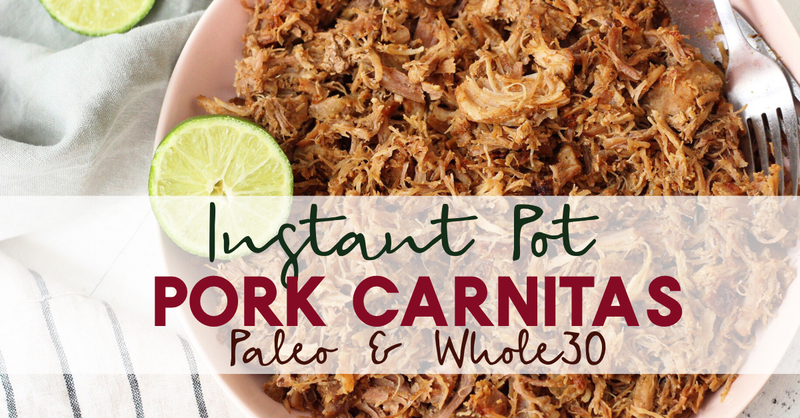 You can use these Whole30 instant pot carnitas in salads, burrito bowls, lettuce tacos, collard wraps, breakfast skillets, you name it! Enjoy! Just made this on the recommendation of a friend who saw the recipe on your site. It was absolutely delicious – didn’t change a thing! I’ve tried a lot of carnitas recipes before but this is my families favorite. I love that you didn’t use an orange! Made this in the slow cooker exactly as written but added a few bay leaves. SO delicious! My new go to for carnitas! Ahh! So happy you loved it, Jennifer! Thank you! I also made it in the crock pot. I think I’ve made all of your crock pot recipes and they are all my favorite but this one will be made weekly! I crisped the meat up for breakfast skillets, my boys had them on tacos and sanehichs for school lunches, and I had plenty left for salads too! I’m so happy to hear this! Thank you for the high praise! I’m glad your family enjoys this recipe! I made this with both pork and chicken in my Instant Pot, and it came out “soooo goooooddd!” as my family says. Thank you for sharing! This will probably be a once a week thing. I cooked this recipe tonight for the first time. I was afraid my son would not eat it but I am happy to say that he cleaned the plate. Thank you, he is such a picky eater. I am so glad he ate it cause I tired of cooking the same thing all the time. Hey, Jennifer!! I am so happy to hear this – comments like this make my day! Thank you for coming back and letting me know your son enjoyed it 🙂 Have a great weekend! The flavor and tenderness of this is amazing!! I used my instant pot and it was super easy. It did end up burning the sauce on the bottom of my instant pot when I was on the sauté mode, has that happened to you? This is only the second time I’m using it (got it for Christmas) so maybe I had the sauté setting too high? Hopefully it’s easy to clean! So amazing and so easy! Just made it and my husband can’t stop raving about how great the flavor is! The meat just fell apart with no effort in the instant pot. Will definitely be making again!